Are you looking for a reliable and affordable garage in your local area? If so, look no further than Exeter Auto Centre. We proudly offer competitively priced vehicle servicing in Exeter. Whether you’re looking for specialist vehicle servicing or an inspection of other elements of your car, we can help. Exeter Auto Centre has all the necessary experience required to carry out professional and in-depth services on your vehicle. Regular servicing is vital for your vehicle’s general maintenance. By having a service with us, you can be sure that you are receiving the best quality service at a competitive price. Our customers can also choose the service that best suits their vehicle, from the comprehensive range that we offer. So, if you think Exeter Auto Centre can help service your vehicle, do not hesitate to get in touch. Exeter Auto Centre takes pride in offering a comprehensive range of car servicing options for our customers. We understand that not every customer’s requirements will be the same. We, therefore, not only offer vehicle servicing such as an; interim services but we also offer a variety of other car service options. By offering such an extensive variety of service options, we are able to meet the requirements of our loyal customer base. If you suspect that there could be an issue with your vehicle, do not wait until its too late. Bring your vehicle to our specialist garage and our expert engineers will service and inspect it until they find the problem. Which Vehicle Service Do I Need? The most suitable vehicle service option for your vehicle is determined by two major factors; mileage and the period of time since the last service. Exeter Auto Centre offers both interim and more intricate servicing options to suit all our customer’s requirements. By viewing the two service options that we offer below, customers can see which is the most suitable for them. An interim service is the more basic level service that we offer here at Exeter Auto Centre. This service involves a 40-point check of your vehicle and is recommended by professionals every 6 months. Having regular services carried out on your vehicle can not only increase the likelihood of it passing its MOT but also the overall value of the vehicle. A service with us is a in-depth inspection which covers intricate aspects of your vehicle. 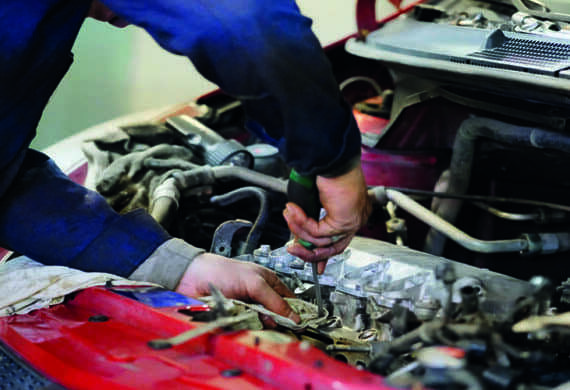 Our service involves our engineers carrying out a 70-point check and ensures your vehicle is in optimum working order. Furthermore, we recommend that your vehicle undergoes a service every 12 months. To book vehicle servicing in Exeter, do not hesitate to contact us on 01392 464640. We look forward to hearing from you soon!